This episode of the Maitripa College Podcast, “The Way to a Meaningful LIfe”, features a teaching from Geshe Pema Dorjee. 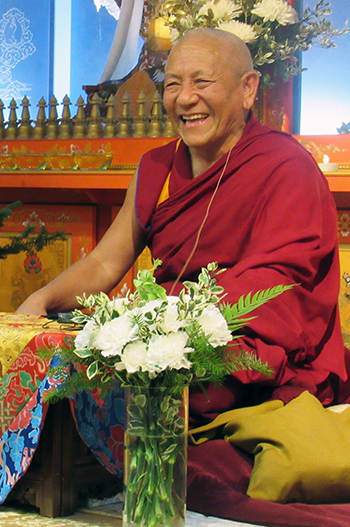 In a traditional presentation of the essence of the Buddhist path, with great humility Geshe-la shares his insights on how to be happy by stopping harm to others and learning to embrace them with compassion and loving-kindness. Interspersed with stories from his personal life, Geshe-la sheds light on a personal attempt at this simple but profound practice. Geshe Pema Dorjee is an internationally renowned Tibetan Buddhist teacher, scholar, and humanitarian who has dedicated his life to alleviating suffering. Born in 1951 into a Tibetan nomadic family, Geshe-la and his family fled Tibet for India during the 1959 Chinese Communist invasion. In India, Geshe-la studied at the Institute of Buddhist Dialectics in Dharamsala and later Drepung Monastic University in South India. Among many other activities, Geshe-la served Tibetan refugee communities in India and Nepal, including the Tibetan Children’s Village School in Dharmsala for 16 years; served at the request of the Tibetan government-in-exile in various capacities; and travels to the most remote and impoverished regions of the Himalayas, creating humanitarian projects to benefit the local people. Since 2001, at the Dalai Lama’s request, Geshe-la has worked to revive the Bodong tradition of Tibetan Buddhism, which was almost completely eradicated in Tibet. Geshe-la founded a Bodong monastery in Kathmandu, as well as a research and publication center to reproduce Bodong sacred texts in Dharamsala. In 2012 he was honored by the Dalai Lama for his humanitarian work.